There are several healthcare institutions across the United States that utilize Equine Assisted Learning activities as part of their training and development for both nurses and medical students. In 2001 Dr. Alan Hamilton, horseman and professor of Neurosurgery at University of Arizona, developed a program utilizing horses to address the difficulty in teaching non – verbal skills to medical students. Since 2005, medical students at Stanford University have participated in a program called Medicine and Horsemanship™, which is designed and facilitated under the direction of doctor – patient communication expert Beverley Kane, MD. Dr. Kane currently consults with medical and nursing schools across the country in developing EAL programs for their students and personnel (Kane, 2004). Other institutions using this type of experiential learning are Massachusetts General Hospital in its Nursing School, University of Southern Florida Health Sciences within its Leadership Institute and Washington State University Nursing School to teach its Effective Communication Training among others . An extensive literature search on this topic suggests that this pilot would be one of the first academic studies to do research on the topic of developing emotional intelligence in nurses via participation in an Equine Guided Leadership Education experience. In the wild horses are animals of prey and though humans are omnivores and have domesticated the horse there still exists an instinctive predator/prey dynamic between humans and horses. Horses communicate non – verbally and rely on immediate feedback from their environment to survive. It is this communication dynamic between horses and humans which provides a rich learning environment – one full of relational problem solving that allows people to learn emotional sensitivity, self and social awareness, self-management and effective communication skills and strategies. Research conducted on non-verbal communication between nurses and their elderly patients found that non-verbal interactions play a vital role in nurse – patient perceptions (Caris – Verhallen, 1999). Similar non-verbal interactions, based on awareness of and effective use of nonverbal skills and heightened perception and sensitivity, are not only magnified when working with horses but foundational for establishing a working relationship with them. Therefore, it is the researchers’ supposition that learning transfer, defined as learning which occurs in one context having an impact on performance in another context (Perkins, 1992), would occur more readily with participation in a facilitated equine guided experience. Horses are also very large animals and working with them successfully requires one to become very present and aware – much like the horses themselves. 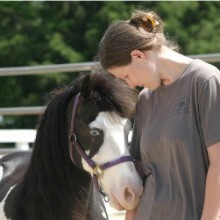 A recent pilot study by Walsh and Blakeney (2013) suggests that working with horses increases nurses abilities to become present. A large body of anecdotal evidence suggests that collaborating with the horse can be an excellent example of learning leadership competency, including emotional intelligence, in and through action. In effect, horses don’t lie. Due to their natural prey instincts they respond honestly to how a person is showing up on both a physical and emotional level and provide in-the-moment feedback. Because horses give feedback on every action we make and every emotion we hold, working with them forces us to engage in first, second and third level feedback or “action inquiry” (Torbert, 2004).